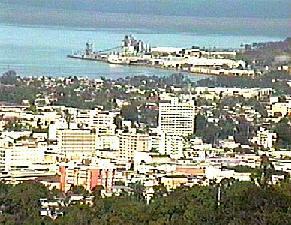 Puerto Rico is an archipeligo in the northeast Caribbean. Politically, it is a self-governing unincorporated organized territory of the United States, that is styled as a Commonwealth in free association with the United States. Control of the islands was acquired by the United States, from Spain in 1898, when US forces invaded and occupied the islands at the start of the Spanish-American war. 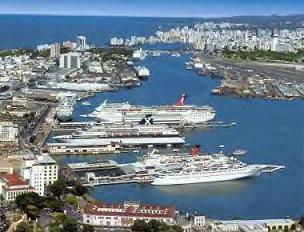 The capital and largest city in the islands is San Juan. Other towns and cities in Puerto Rico include Aguadilla, A�asco, Arecibo, Bayamon, Caguas, Carolina, Fajardo, Guanica, Guayama, Guayanilla, Isabela, Mayag�ez, Ponce and Vieques. 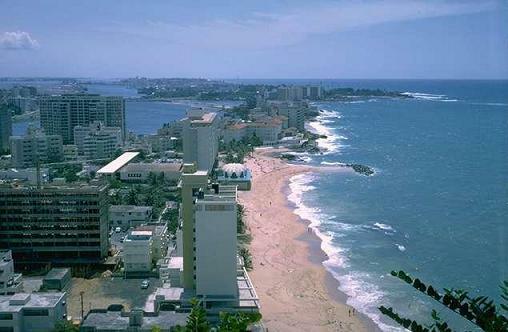 Approximately 5 million tourists, mostly from the United States of America, visit Puerto Rico each year. About a third of these tourists are cruise ship passengers. The Commonwealth is of course known for its beautiful beaches, but there are also a number of tourist attractions in Puerto Rico. Perhaps the most spectacular of these is Cruceta El Vigia in Ponce, which is a 100 feet (30 meters) tall cross, containing a 10-storey vertical tower and a horizontal "sky bridge", and which offers some truly spectacular views of the surrounding area. Leading education institutions in Puerto Rico include the Ana G. Méndez University System's Metropolitan University (in San Juan), the Inter American University of Puerto Rico, the Polytechnic University of Puerto Rico (in San Juan), the University of Puerto Rico (in San Juan) and the University of the Sacred Heart (in San Juan). Sports teams in Puerto Rico include Atenienses de Manatí (Manatí Athenians) (baseball) in Manati, Criollos de Caguas (Caguas Creoles) (baseball) in Caguas, Gigantes de Carolina (Carolina Giants) (baseball) in Carolina, Indios de Mayagüez (Mayagüez Indians) (baseball) in Mayagüez, Leones de Ponce (Ponce Lions) (baseball) in Ponce, Lobos de Arecibo (Arecibo Wolves) (baseball) in Arecibo, and Puerto Rico Islanders (USL-1 soccer) in Bayamon. Major airports serving Puerto Rico include Fernando Ribas Dominicci Airport, and Luis Muñoz Marín International Airport, both of which are in San Juan. Places of interest in Puerto Rico. General information about the commonwealth such as population, symbols, etc. Guide books with travel information about Puerto Rico. History information and books for the commonwealth. Towns and cities in Puerto Rico.